Giant Gastric Perforation: A Clinical Image. S Bhat, S Mohan, S Koul, N Kaul. Giant Gastric Perforation: A Clinical Image.. The Internet Journal of Surgery. 2009 Volume 26 Number 1. Giant gastric ulcers are defined as ulcers measuring 2cm or more. They are known to perforate. Gastrectomy is the procedure of choice in a stable patient. We are presenting an atypical variety of giant gastric ulcer perforation with an associated small pyloric perforation. Gastric ulcers have been classified into five different types according to the modified Johnson’s classification1. Giant gastric ulcer is defined as an ulcer measuring 2cm or more2. It usually presents on the lesser curve aspect of the stomach; nevertheless, any type of gastric ulcer may present as a giant ulcer. It has a high likelihood of developing complications3. We came across a very large gastric perforation with an associated small pyloric perforation in a 55-year-old male, the kind of which seems not to have been reported before. The patient presented as a case of perforation peritonitis. The diagnosis was confirmed on chest X-ray which showed gas under the right dome of the diaphragm. After the necessary preliminary treatment, the patient was taken for surgery which initially revealed a small perforation in the pyloroduodenal region. The left lobe of the liver was adhered to the anterior surface of the body of the stomach. Adhesiolysis was performed and an extremely large gastric perforation along the lesser curve of the stomach, measuring approximately 11-12cm and extending from below the fundus up to the pyloric antrum came into view (fig. 1, fig. 2). Initially we appreciated the smaller perforation to be present in the first part of the duodenum; however, on close observation it turned out to be a pyloric perforation (fig. 1). The giant perforation was so big that nearly the whole anterior wall of the body of the stomach was conspicuous by its absence and the posterior mucosal folds were clearly visible (fig. 1, fig. 2). Figure 1 showing the giant gastric perforation in the body of the stomach with a small pyloric perforation. The pylorus can be clearly made out. 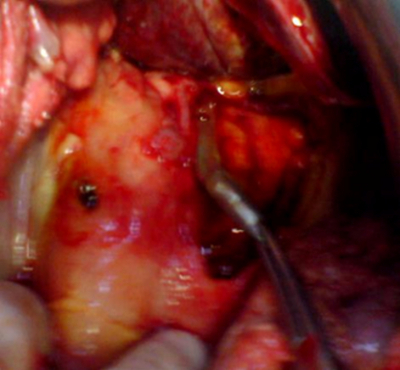 Figure 2 showing both perforations after mopping of the peritoneal cavity. The extent of the giant perforation and the posterior mucosal folds are clearly seen. 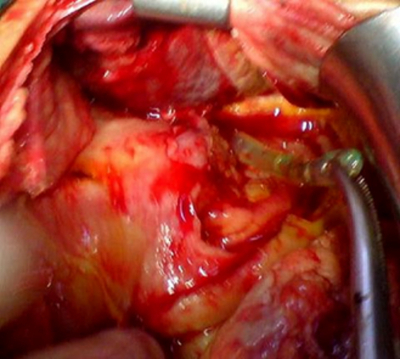 A subtotal gastrectomy with Roux-en-Y gastrojejunostomy and feeding jejunostomy was done. Postoperatively, the patient developed a leak from the feeding jejunostomy on the fifth postoperative day which progressively increased; he was re-explored on the seventh post-operative day and the feeding jejunostomy was reconstituted. The biopsy revealed chronic lymphocytic infiltration and non-specific changes suggestive of chronic peptic ulcer disease. The patient was discharged on the sixteenth postoperative day. The follow-up period of the patient for more than one year remained uneventful. The management of a perforated giant gastric ulcer depends upon the clinical condition of the patient. As the risk of harboring an underlying malignancy is quite high, gastrectomy is the procedure of choice in a stable patient.3,4 The extent of resection depends upon the size and the site of the perforation. In addition, vagotomy is reserved for type-2 and type-3 gastric ulcers. On the contrary, if the patient is unstable, primary closure of the perforation with an omental patch is done after taking multiple biopsies.4 In our case we had to do a subtotal gastrectomy because of the very large size of the perforation. We could not find a reference to the type and the size of perforation as big as in our case in the literature. The case appears to be a complicated atypical type-2 gastric ulcer with a pyloric perforation instead of the duodenal one or a combination of the type-1 and type-3 gastric ulcer perforation. In this era of potent anti-secretory drugs, Helicobacter pylori eradication regimens and precise diagnostic modalities, we still find such cases, thereby making a strict protocol for peptic ulcer disease binding for all the practicing physicians. 1. Fisher WE, Brunicardi FC: Benign Gastric Ulcer, in Cameron JL (ed): Current Surgical Therapy, 9th ed., Philadelphia: Mosby Elsevier, 2008, p. 81. 2. Barragry TP, Blatchford JW, O’ Cooner AM: Giant gastric ulcers. A review of 49 cases. Ann Surg; 1986; 203: 255-259. 3. Raju GS, Bardhan KD, Roystone C, Beresford J: Giant gastric ulcer. Its natural history and outcome in the H2RA era. Am J Gastroenterol; 1999; 94: 3478-3486. 4. Harbison SP, Dempsey DT: Peptic ulcer disease. Curr Probl Surg; 2005; 42: 346-454.